Take a Medium Head of Cabbage and Peel off the Leaves in Whole Pieces. Place Cabbage Leaves in Large Stock Pot. After 10 Mins, drain and lay flat to cool. In Saute Pan warm Olive Oil. Saute Ground Beef and Ground Pork in the Olive Oil. When Meat starts to sear, Add Onion and Garlic. When onion is translucent Add Worcestershire Sauce and Celery Salt. Remove from heat when filling is thoroughly combined and heated through. Lower Heat, Let steep 15 mins on Med Low. Place 1 Cabbage Leaf on a flat plate. Using Tblsp, scoop filling and mold into cannell. Place filling at edge of cabbage leaf closest to you. Fold edges @ end inward. Roll filling into cabbage leaf, folding the ends inward as you continue. Place Cabbage Roll in baking Vessel with folded edge at bottom of pan. 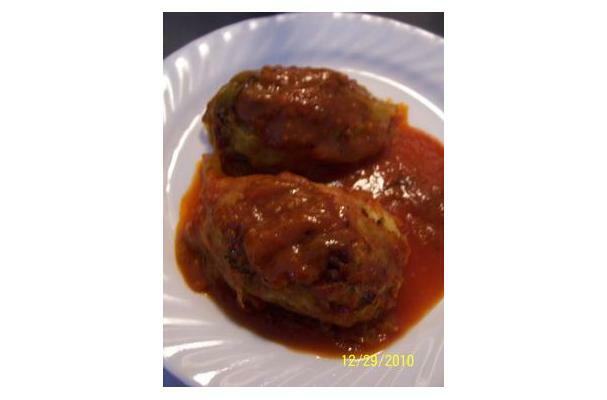 Cover Cabbage Rolls with Sauce. Bake @ 400f for 30 mins. Serve. Note: For the Sauce. I wanted the onion and the celery grated as I like a smooth sauce. It also seems to have an effect on the onion that makes it less potent. It seems to "melt" into the sauce this way. It truly was a great outcome. Hope you try it soon!